Danby - DDR030BDWDB: Dehumidifier Review • The Air Geeks, reviews of air conditioners, dehumidifiers and air purifiers. Dehumidifiers are important assets to have, especially for those poorly ventilated houses that make you feel sickly and uncomfortable every time you are there. 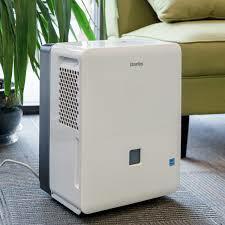 We have researched several dehumidifiers and came along this one we thought you might like it. 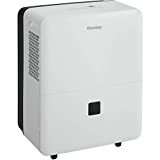 Danby Energy Star 30-pint dehumidifier is designed to create a cool and fresh environment that is free of excess moisture which we all know causes a lot of problems. We’ll head straight to its features and sees which ones really stand out so you can determine whether it’s up to your standards. This appliance has a dehumidifying rate of 30-pints of moisture per day. With its 6.3-pint capacity water tanks, this would mean you will have to replace the water tanks when they get full about 4-5 times a day when running at full capacity. This might feel annoying to some people especially those caught up in tight schedules. This obviously adds to other time needed to tend to the appliance so it would be worth to try if you already have the items. Danby Energy Star 30-pint covers a space of up to 1500 square Feet so it would be ideal to medium space rooms. It also works great basements with an even slightly larger area. As for the noise level, well, it is not the best out there and users have sometimes complained about the loud noise during the higher setting. Thus, it would be better to use lower fan setting during the night or put it in another room altogether if you feel the sound is unbearable. The noise on the lower setting is however not a big problem as it is not loud enough to drown other audio devices such as TVs or the home theatres so you can continue to binge on your favorite shows even when the item is running. The sound is however noticeable during sleep so it is not ideal to be placed in places where there are small kids and newborns’ nursery. Maintaining this appliance is rather easy with its easy to remove water tanks which can be emptied easily. The filters can be easily washed and reused instead of replacing them. It is also fitted with caster wheels that facilitate easy movement in case you want to change its position. However, you might want to be a little bit careful if you need to lift it up as it does not have handles with good grip. This dehumidifier works even in temperatures as low as 41F using its auto-defrost technology that ensures that the coils are always ice-free enabling the fans to rotate. This enables it to work in extremely cold environments without any difficulty. Its power outage auto-restart function works great to restore your previously saved settings so you won’t have to reset it again once the power is back on. This means you can just set your favorite settings and forget without it resetting to default factory settings. The settings allow you to set between two levels of fan speeds depending on the state of the room you want to dehumidify. The unit is fairly easy to operate and use. The water tank is easily accessible from the front and is emptied easily. It also has an indicator light that notifies you when the tank is full so you can empty it. It is easy to move around, due to the omnidirectional caster wheels fitted underneath that facilitates easy movements. It is also worthwhile to note the fact that there is no option to connect the tank to an external reservoir using a hosepipe so you will have to empty it yourself every time the tank fills. This could spell a deal breaker for some people so it is important to note that. Works well in low temperatures: It is fitted with auto-defrost technology to prevent ice accumulation on the coils. Higher noise level: It is not suitable for use in bedrooms or kids' rooms as the noise emitted is can affect the quality of sleep. It isn't terribly loud and it works well for a five hundred square foot apartment. However, it does use quite a bit of energy. The plastic coating over the buttons on top of the unit is starting to peel slightly. Overall, I am happy with the unit. It has dried up my apartment, and now that I only run it an hour or two a day, it is much more cost efficient." Very good dehumidifier at an attractive price. Two-year warranty with local service centers is a bonus. 30-pint capacity is only adequate for small or mildly damp areas. Choose a higher capacity Danby model if necessary." Going by the features described above, Danby Energy Star 30-pint dehumidifier works best for middle-sized spaces and while it does its job considerably well, a lot of features crucial for a great dehumidifier were left out. Ability to connect to a hosepipe would have really been a good improvement for this product. Also, better labeling of the controls on the control panel is important so users do not have to keep referring to the manual every time they want to change the settings would be great which need to be improved. If you feel this product would work great to get rid of bad odors in your basement or provide fresher air indoors, that great! Meanwhile, why don’t you check our other dehumidifier reviews so you can see what they too have to offer?